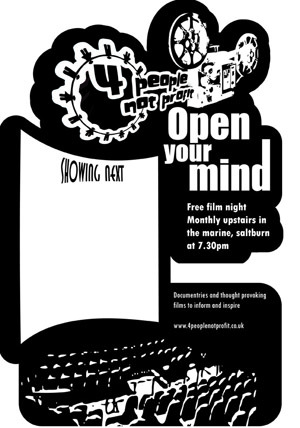 4 People not profit have launched a brand new venture, putting on reguler free film nights. The nights are to be held monthly/bi monthly at the Marine hotel on marine parade on thursday nights. We will be showing a range of alternative and independent films covering human rights, social justice and enviromental issues and themes. All the films will be free of charge and there will be opportunity for open discussion afterwards. The opening night screened ‘The power of community: How cuba survived peak oil’ on august the 17th and was a success, with a lively discussion after the film. The second film to be screened will ‘Life and Debt’ on Thursday the 22nd of September, doors 7pm film 7.30pm. This film is set in Jamaica, land of sea, sand and sun and a prime example of the complexities of economic globalization on the worlds developing countries. Using conventional and non conventional documentry techniques, this searing film dissects the ‘mechanism of debt’ that is destroying local agriculture and industry in third world countrieswhile substituting them with sweat shops and cheap imports. Bring some friends and some beer money and enjoy! !